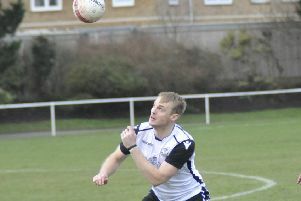 Bexhill United Football Club is gearing up for what manager Ryan Light believes could be the season’s first pivotal weekend. Second-placed Bexhill will make the long trip to fifth-placed Selsey while third-placed Steyning Town host leaders Alfold in Southern Combination League Division One tomorrow (Saturday). Bexhill are a point behind Alfold having played an extra game and above Steyning on goal difference having played two more matches. They are 12 points better off than Selsey having played one more fixture. “There’s a lot of excitement around the club,” continued Light. “It’s a three-horse race and it’s so close between us three. I would always rather have the points on the board. We’ll take it a game at a time, keep trying to pick up three points and see where it takes us. “It’s very important that we bring back something from Selsey. It’s a long journey, it’s against a side that’s above us in the form guide - they’re unbeaten in their last six and on a really good run. The first of Bexhill’s two draws this season came in September’s reverse fixture against Selsey when they recovered from 2-0 and 3-1 down to salvage a point via Craig Ottley’s late penalty. “A lot of it was our own doing,” said Light. “It was one of our poorest starts to a game this season (Bexhill conceded twice early on) and was the first time we’ve conceded three goals in a game (the only other time in the league this season was the 4-3 win at home to Seaford Town). Bexhill will head west in red hot form having scored 14 goals and conceded none in their last three outings. In fact, they’ve now scored four or more goals in a game 12 times this season and their goal difference is a remarkable +53. Bexhill’s remaining nine games, seven of which are away from home, will be spread over an 11-week period. After tomorrow they are only due to play once until March 9. The consistently impressive Nathan Lopez has a slight tear in his quadricep muscle and is likely to be sidelined for around three weeks. Drew Greenall is available again for tomorrow’s match, while Chris Rea and Georges Gouet may drop out of the squad. Southern Combination League Division One top five (played-points): 1 Alfold 22-54 (+40 goal difference), 2 BEXHILL UNITED 23-53 (+53), 3 Steyning Town 21-53 (+36), 4 AFC Varndeanians 21-42 (+26), 5 Selsey 22-41 (+22).